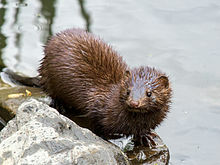 Mustelinae is a subfamily of family Mustelidae, which includes weasels, ferrets amd minks. It was formerly defined in a paraphyletic manner to also include wolverines, martens, and many other mustelids, to the exclusion of the otters (Lutrinae). Some of the fashion furs come from this subfamily: ermine, weasel, mink and polecat.